We’re edging closer to the proposed June release date for Faith and Flame: the Provencal Tribunal. Some of the art is starting to trickle through, which is always fun as an author to see how the artists have interpreted some of your ideas that have up til now just been words in your head or on the screen of a word processing program. The latest update is the release of a downloadable PDF of the Table of Contents on the Atlas Games site. Check it out for a sneak preview of what the supplement holds! I’ll be closely watching what the comments are over at the forums here and working on the associated cut-files with the intent of posting some of the material here or submitting articles to Sub Rosa. 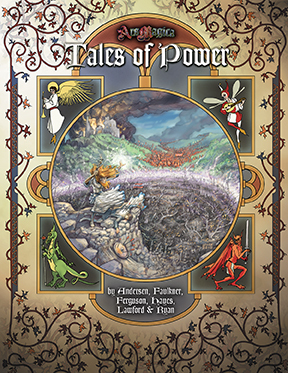 Tales of Power now has a cover up over at the Atlas Games website and is apparently slated for a May release. Hopefully a ToC will follow soon. It’s the second supplement I’ve worked on for the line, and even though I only played a small part in its production, I’m very happy with my contribution. I think the new artist, Christian N. St. Pierre, has done a wonderful job of the cover scene. Bravo!